Having a wrist full of beautiful bracelets is all the rage right now – which may be why I have received several different beautiful bracelets to feature in this year’s Christmas in July Event! All of them have been absolutely dazzling, and it would be impossible for me to choose a favorite! 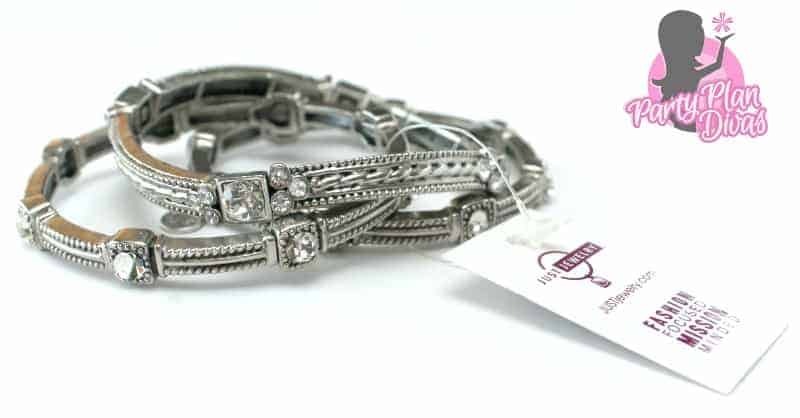 This next bracelet -sent in by Independent Just Jewelry Consultant Rebekah Stowers – is actually a bracelet trio! Sold as one, the Dazzling Bracelet has been a best seller – and it is easy to see why! The Just Jewelry Dazzling Bracelet is Rhodium plated with rhinestone interruptions and can be dressed up with your favorite little black dress or dressed down with your favorite pair of blue jeans. They give more sparkle than pictures could ever do justice for, and are stretch bracelets so they easily slide on and off. I have worn these bracelets many times since receiving them for the gift guide, and every time I have gotten compliments on them! They are lightweight but sturdy – and have I mentioned how much they sparkle!? Just Jewelry is a direct sales company that focuses on offering affordable, on-trend clothing and accessories for women of every age. Just Jewelry is all about helping women succeed but also giving back to the community with their multiple donation programs for everything from breast cancer research to autism, heart disease, and more. Ten percent of every purchase from Just Jewelry’s entire line is donated to local & international missions. Just Jewelry is “fashion focused and mission minded” – how amazing is that? Just Jewelry offers an extensive line of products that meets every style. As a Just Jewelry Hostess, you receive free and Hostess Exclusive items for sharing these beautiful products with your family and friends. As a Just Jewelry Consultant, you can build a business offering gorgeous products and know you are making a difference in people’s lives around the world! Check out Rebekah’s website to learn more about how you can get involved with Just Jewelry!